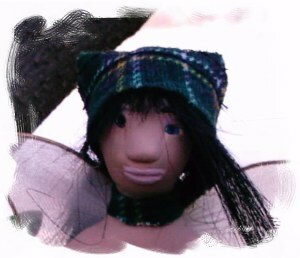 Mei Ling is part of the Asian Faeries Series. She is approx. 3.24 inches tall. She has straight black hair beneath a green plaid head scarf. She wears a matching choker. 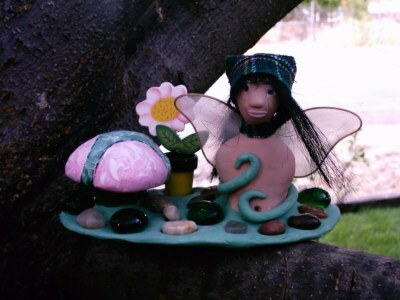 She has blue eyes made of shimmering blue beads embedded into the clay. She has gold and white nylon wings attached to her back. Green clay vines wrap gently around her body. She is on a clay base. Mei Ling is accompanied by a green and pink clay mushroom and a pretty pink and white bobbing flower. The ground around her is covered by rocks and glass stones. This piece is approx. 5 and 1/2 inches long.